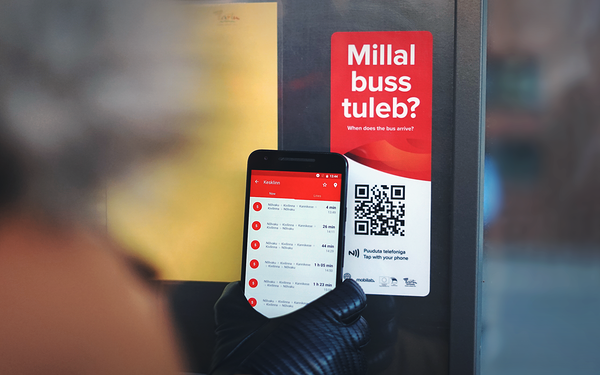 In cooperation with Tartu City Government and Mobi Lab, stickers with QR codes and Near-field communication (NFC) were placed at bus stops in Tartu. By scanning the QR code or touching the NFC sticker, information regarding the arrival of busses at that specific stop will quickly be displayed on the user's smart phone. The information in the application is displayed in real-time and the mobile application works in the same way as the real-time information display found at the bus stop. While the stickers could previously only be found at bigger bus stops within the framework of the pilot project, practically the entire city is now covered. The displaying of information on the user's smart phone takes place via the Tartu Bus Schedule app, designed by Mobi Lab, which is available for Android as well as iOS operating systems. If the person who is scanning or touching the sticker doesn’t yet have the app installed, their phone will show information on the website and also instruct them on how to download it. According to Veiko Raime, founder of Mobi Lab, the initial pilot project was quite successful and the residents of Tartu have quickly discovered the app. ‘Bus users are sharing information about the app with their friends, without any large-scale advertising and awareness campaigns being carried out. As of today, the app has more than 15,000 unique users each month, and there are around 3500 daily users, added Raime. The number of users will likely grow further following the increase in visibility of the stickers around the city. The project has been supported by Enterprise Estonia's cluster development program from European Regional Development Fund.